Facebook Pages that pretend to be the real Facebook Pages are scammers and copycats out to take advantage of you. According to Facebook, up to 11 percent of user accounts are fake, including fan or business Pages. Typically, these Facebook Pages PRETEND to be a popular, authentic Page and use the same name. This common method fools YOU into believing the Page posts are coming from the real Page with the trusted community. Since the individual behind the COPYCAT, imposter Facebook page is dishonest, how do you know if your personal information is being sold to third parties that may use your information? These IMPOSTER Facebook Pages may also try to mimic the REAL Page to further trick you into believing it’s the REAL page. Then, when you engage with comments on the Fake Page posts, your friends see that in their newsfeed and join in the scam. Note: Army Mom Strong is NOT affiliated with any Facebook groups or donation pages. 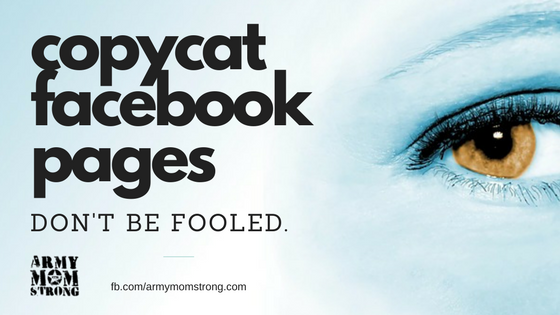 If you see a Facebook group or donation page using the name Army Mom Strong, they ARE a COPYCAT and unethical. What if you Like the Products from the Fake Page? 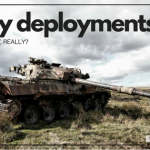 We live in a free country and you can purchase whatever you like. Consider that the person doing the selling is stealing the goodwill of the original community and tricking you in order to make the sale. If you like to participate with unethical people, that’s up to you. How Can You Identify Imposter Facebook Pages? 1 – Look at the logo that appears next to the name. Here is what our official logo looks like. 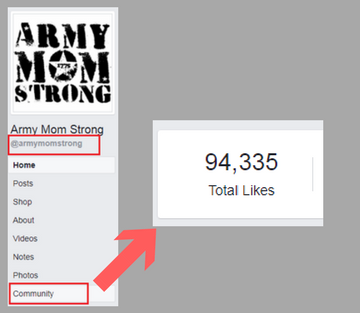 If you see a different logo next to the Page name “Army Mom Strong”, that Page is tricking you. 2 – Click Community on the left side. See the number of Total Likes. If it’s less than 94,000, then the Page is an imposter. 3 – See the @ sign on the left side of the Page. 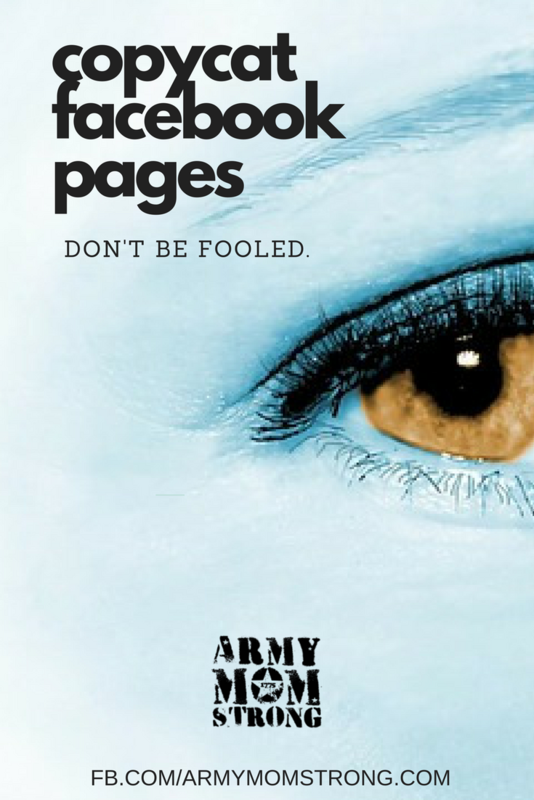 If it’s NOT @armymomstrong, then you are following and engaging with a Page that is pretending to be our real Page. Consider that before you participate. When Facebook Pages have to impersonate other Pages in order to sell you something, that is a form of theft. Stealing the goodwill of a community built on trust and honesty. You have no idea how your personal information is being used or who it’s being used by. As military families, we must be extra cautious about suspicious Facebook Pages that pretend to be another Page with the intent of tricking you. You never know who is actually tricking you or what they will do with your information. Be sure to check the authenticity of a Page before you engage with or make a purchase from that Page.